One day, mid-meltdown while sitting on a mini mountain of clothes I accidentally made while looking for something to wear, I imagined a fairy fashion godmother dropping off a box of pieces I actually liked to my doorstep and all would be solved. Who would have thought that there actually is a service that can make your styling problems magically disappear? Music to my ears (and wardrobe). Here at Who What Wear, many of our editors have found themselves in a similar situation, which is why managing editor, Kristen Nichols, wanted to test out Stitch Fix, the personal styling service that literally delivers clothes to your door. “I had heard great things about Stitch Fix but never tried the service for myself. I’m very impressed by how perfectly they nailed the sizing and tapped into pieces I would pick out myself,” she told me when I asked her about her experience. The steps to curating your wardrobe are easy, too. You fill out a Style Profile quiz so that your personal stylist can get to know you better, and, ta-da, your box of goods is delivered. 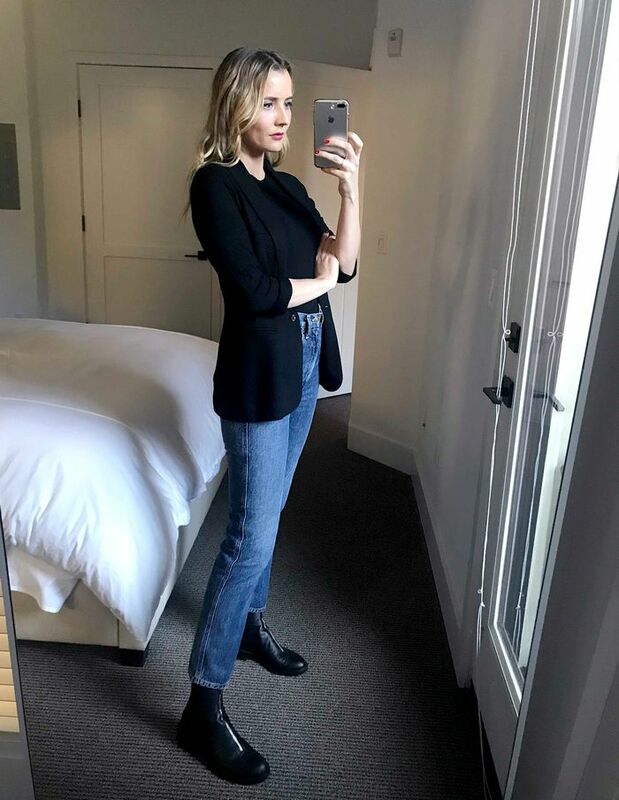 Kristen’s box was full of pieces that seamlessly fit into her existing wardrobe: perfectly polished staples that she can wear to the office or to drinks on the weekend. See her favorites here. Making a statement with your outfit this spring is about injecting some color into your look, but a head-to-toe ’fit might not be for everyone. For Kristen, she found that this black sleeveless top was perfect to balance out the yellow pant-and-shoe combo. “A classic sleeveless top like this grounds the bold yellow jeans and shoes,” she told me. Does it get better, though, than a striped sweater with jeans? Stitch Fix sent Kristen a soft gray crew-neck sweater she initially thought was something that didn’t fit her wardrobe. “Jeans and ankle boots are the foundation of many outfits I wear, but I’m definitely lacking in the sweater department. This on-trend crew-neck sweater is the perfect addition to my outfit and something I would wear to brunch with friends on the weekend,” she admitted. Like skinny jeans, black pants with a slimmer fit are the key to looking pulled-together. “The fit of these pants make it the perfect canvas for me to pull on a houndstooth blazer and classic pumps for a day full of meetings,” Kristen mentioned when I asked her what her favorite piece from the box was. “They’re the ultimate piece to pair with a blazer and heels for the office, but I would also wear them on the weekend with a T-shirt and sneakers,” she added. What's better? The fit of the pants made Kristen feel confident enough to take on the toughest question at her next meeting. So the secret is out: You now have the key to unlocking an editor's method of always looking pulled-together. Next up: Go to Stitch Fix and fill out the Style Profile for yourself to get matched with a stylist.